Who knew that Germany also did wine? Although this fair is called Wurstmarkt (literally the "sausage market"), it is an annual folk festival famous for its celebration of excellent local wines. Located in the heart of Palatinate, Germany's second largest wine growing region, the Wurstmarkt prides itself in being the world's biggest wine festival. It has been called the wine version of Munich's Oktoberfest and takes place every second and third weekend in September in the spa town of Bad Dürkheim along the German Wine Road. Plan your trip with the guide to Dürkheim Wurstmarkt. The culinary event has been celebrated for around 600 years, and what started as a fair for local farmers and wine growers now attracts more than 600,000 visitors drinking hundreds of thousands of liters of wine annually. This area was once the site of ancient wineries and it is thought that 2,000 years ago the Romans were cultivating the same grape varieties as today. By the 12th century, growers began to gather here to sell their produce to the pilgrims heading to the chapel (Michaelskapelle) on top of a nearby mountain (Michaelsberg). By 1417, the event was known asMichaelismarkt. The Fest eventually became known as the Wurstmarkt in 1832 due to the large number of sausages on sale. While pilgrims continued their plight on St. Michael’s Day until the 15th century, the Wurstmarkt is now an attraction in itself. Attend on the opening day to watch the Mayor open the event as well as a jubilant parade. Stay for the wine. Over 150 local wines from nearly 40 historic wineries will be poured during the Wurstmarkt from fine rieslings to pinot noirs to sekt (sparkling wine) to eiswein ("ice wine" best for dessert). The landmark of the Wurstmarkt is the world's largest wine barrel known as Dürkheimer Riesenfass (or just Fass or Därgemer Fass for the locals). It has a diameter of 13.5 meters and can hold 44 million gallons of wine, but has been transformed into a multi-level wine shop and restaurant. A visit during the festival is a must. 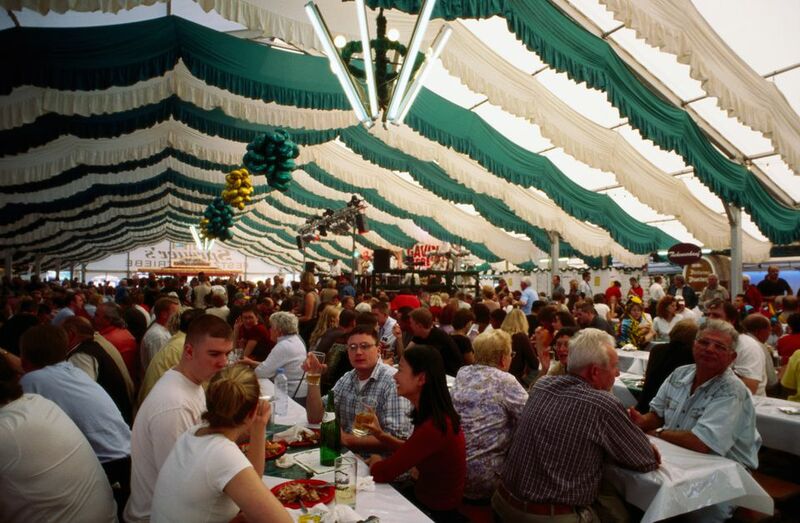 Visitors can sip their wein in several large tents (again like Oktoberfest), where wine connoisseurs sit together at long wooden tables, or at a traditional schubkärchler (small wine stand). Wine is served in classic stemmed glasses, or you could go full party mode with a hefty half-liter dubbeglas. This is smaller than Oktoberfest's 1-liter Mass, but still pretty weighty for wine. The best option is to go with a group and share several glasses among the group. And if you can't handle the thought of a day only with wine, rest assured that the Germans also supply a beer hall and non-alcoholic options. Alongside wine tasting, visitors can enjoy the glorious food of the Palatinate region. Here, too, you will find wine; used in sauces, when making sauerkraut and even to moisten burger mince. Or embrace the name and fill up on juicy bratwurst and finger-sized Nuremberg rostbratwurst. These delicious options are part of the experience and a necessary step to soak up some of that wine. Besides eating and drinking, visitors enjoy live music, carnival rides, literature contests in Pfälzisch (the regional dialect), carnival rides and fireworks. Just like most German folk festivals, there will also be traditional German brass bands playing schlager music and popular hits. If you want, sing along, dance on benches, and link arms with your neighbor in a feeling of pure gemütlichkeit. Opening Hours: 10:00 a.m. – 1:00 a.m.
Getting There: The closest international airport is the busiest airport in Germany, Flughafen Frankfurt. The best way to get to Bad Dürkheim is by train. Take an Intercity express train (ICE) to Mannheim, from there, use a regional train via Neustadt to reach Bad Dürkheim. You can also rent a car.